pregnancy photography with flowing material. 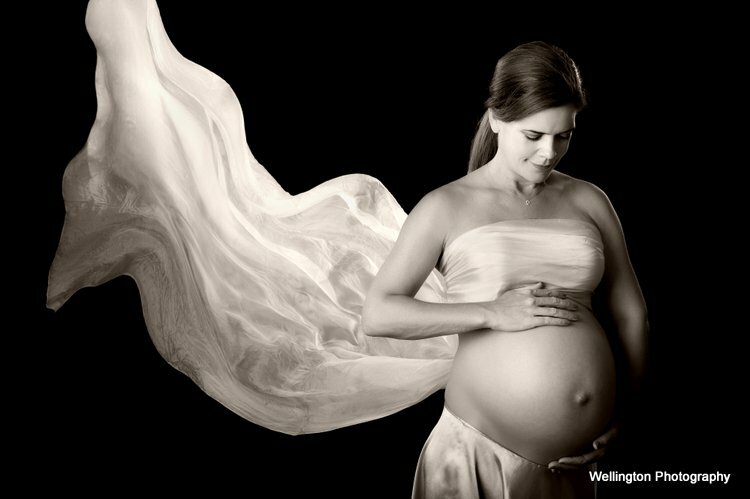 Wellington photographers can offer some of the very best in fine art pregnancy portraits, creating graceful, sensual and flattering photographs of pregnant mothers and their partners. The ideal time to take Maternity photographs is around the 32nd to the 35th week of your pregnancy. This will mean you have a great shape for pictures, but not so late that you are likely to dash off to the ward halfway through the shoot. Many photographers offer package deals that include the pregnancy photo shoot and also a new born portrait session. New born babies can be photographed asleep or awake, the sleeping baby shots are very natural and look very cute. Babies change so much in the first year, that it’s a great idea to arrange 3 or 4 portrait shoots. You will never get the chance again to capture all those special times and changes in your baby. Studio shoots offer the best quality and lighting opportunities, however maternity portraits done in your own home offer a personalisation that makes the portraits more individual and special to you. For newborn portraits, if you are struggling to get to grips with all the things you need to do for this special little person or if your baby is not settled a photo shoot in your own home might be ideal.